Seattle, the largest city in Washington and considered one of the most livable in the United States, is growing in leaps and bounds. Gateway to Asia and icon of the Pacific Northwest, Seattle is a showcase of tall building and technological innovation, with transformative firms such as Microsoft, Starbucks, Amazon, and more calling it home. The city’s reputation for livability and leadership is spurring a surge of tech-sector expansion and tall building construction, with a number of active cranes dotting the skyline. The Amazon Headquarters as it nears completion. Although the city is currently only home to 15 150-plus-meter skyscrapers, it is still has the 10th most skyscrapers of any municipality in the United States. By comparison, it is the 22nd largest city in the country in terms of population. The Seattle Region Tour gave conference delegates the opportunity to explore the city’s densifying core. Throughout the two-day event, the tour took attendees to Seattle’s most famous skyscrapers and monuments as well as the projects under development that will transform the city moving forward. After an evening and morning of travel following the completion of the three-day New York leg of the 2015 conference, delegates met for lunch and a presentation of the day’s activities by NBBJ, one of the organizers of the tour, at their office. Following lunch, the group traveled on foot to the construction site of the future Amazon Headquarters. 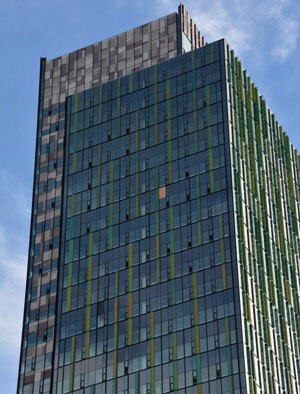 At the time of the visit, the tower was nearing completion, with cladding covering virtually the entire building. 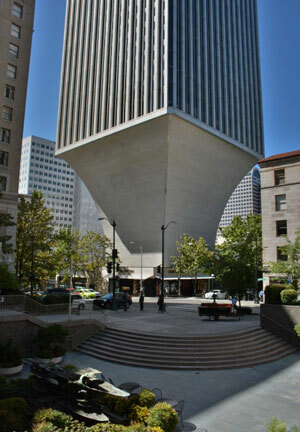 Rainier Tower cantilevers over its base. Just across the street from the Amazon Headquarters, the group toured the Via6 residential complex, which comprises two matching 81-meter residential towers. Completed in 2013, the two towers offer a variety of rental options. The group was not surprised to learn that the tower consists of rental units, as this follows a pattern that has been documented in most American cities of a tendency to favor rentals following the 2008 recession. 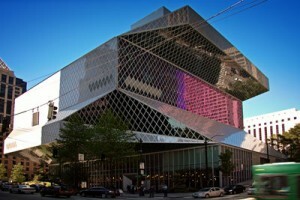 The Seattle Public Library features diagrid supports and vertical stacking. After visiting the Bill & Melinda Gates Foundation, the group concluded the first day of touring with a cocktail reception at Chihuly Garden & Glass, located at the base of the Space Needle – Seattle’s most iconic tall structure and cultural attraction. Day two of the Seattle trip began bright and early at the office of Magnusson Klemencic Associates, located in Rainier Tower. Over breakfast, the group learned of the day’s activities and was given a brief history of Seattle skyscrapers. The evolution of Seattle’s central business district as illustrated by changing skyscraper typologies would be the theme for the day as the group toured the downtown core. The Seattle Public Library features diagrid supports and vertical stacking. The first stop of the day was to the Seattle Central Library. Designed by OMA and LMN Architects, the library features diagrid supports and vertical stacking. Although it does not exactly qualify as a tall building, it features many of the structural elements that are used in modern high-rises. Next the group travelled to the IBM Building, designed by Minoru Yamasaki Associates. Completed in 1964, the building would serve as a prototype for the original World Trade Center towers, also designed by Yamasaki. Caddy-corner to the IBM Building is Rainier Tower (where the day started), and Rainier Square, the future site of a 259-meter tower designed by NBBJ. After examining the Rainier Square site, the group visited the expansive Seattle Convention Center, which features a large semi-circular glass roof. Before lunch, the group next visited the City Centre, a late-80s post-modern office tower. The final activity of the day brought the group to a Seattle Sustainability Leadership event hosted by Glumac. Following that, attendees were encourages to visit Seattle’s many cultural and tourist destinations with whatever remaining time they had in the Emerald City.